Lewis Moore admired Sam Nicholson’s rise from Riccarton academy prospect to Hearts idol. He was inspired seeing the winger establish himself in the first team, score a raking 25-yarder against Hibs and win a Championship title medal. Now, 19-year-old Moore finds himself stepping into the breach Nicholson has left behind. He isn’t daunted, although he has fair-sized shoes to fill following Nicholson’s departure to Minnesota United. Hearts’ promote-from-within policy means Moore is next in line to step up and, as a fellow left-winger, he has modelled himself on Nicholson. The youngster is back competing for that wide left slot at Motherwell tomorrow after recovering from a hamstring injury. He is acutely aware that taking on the mantle of Nicholson is a considerable task but, on the evidence of his opening-day performance against Celtic, young Moore has the attributes to emulate his predecessor. “Sam was the player I would look up to when he was here. The fans liked him. He was just like me – direct, scored goals, good with both feet. He came through the academy as well,” said Moore, speaking exclusively to the Evening News. “I don’t get distracted by playing in his position, I just get on with it. If I do as well as he did then I’m doing alright. He would be happy for me because he’s that type of guy. He’d help you with anything. Injury stopped Moore from building momentum after the Celtic match three weeks ago so he is now eager to pick up where he left off. “I’m fine now, there’s no pain any more so hopefully I can be involved tomorrow. I’ll just need to wait and see. Hopefully I’m at least on the bench and I can try to get on. 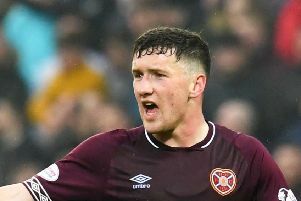 Like Nicholson, Moore is a bona fide Hearts academy graduate having first trained with the club aged ten at a satellite training camp in Ballieston. The request to step into the first team at Celtic Park was hugely unexpected for someone with only one senior appearance in maroon to his name. “I didn’t expect it at all. When Jon Daly was asked to step in as interim head coach, he told me he was planning to put me in,” explained Moore. “That was a few days before the Celtic game so it gave me a few days to get it in my head and manage to get some sleep. “That was important for me. When I made my first-team debut a couple of years ago, I was told the day before and I just couldn’t sleep at all. Having those few days did help. Daly has become something of a mentor for Moore and clearly harbours plenty faith in his teenage protege. The pair worked together at under-20 level and Daly has been determined to help smooth the player’s transition to senior level. “When you have somebody who believes in you, then you feel confident. You want the ball all time to take players on. Jon helps me a lot. He speaks to you and pushes you constantly. He’ll tell you to believe in yourself. If you’re at Hearts, you’re a good player and you’ve got to take advantage of that. Daly, of course, could potentially seal the Hearts head coach’s job permanently with a win at Fir Park. This will be the Irishman’s fourth game in interim charge following a 4-1 defeat at Celtic, a 1-0 win at Kilmarnock and last weekend’s goalless draw with Rangers at Ibrox. Club owner Ann Budge has confirmed she will make an announcement on the position next week and Daly is a serious contender along with former Hearts captians Steven Pressley and Paul Hartley. If he plays tomorrow, Moore will be doing everything possible to help his Under-20 coach achieve an internal promotion. One of the areas where Daly has helped Hearts improve since Ian Cathro’s exit is on the training field. Players feel they are working harder under the watchful eyes of Daly and coaches Austin MacPhee and Liam Fox.